Later topic: K152 plates - Canada / Montreal? My wife and I recently moved our 1954 Heidelberg windmill to a new studio. Mid-transport, disaster struck. Long story short, I had to brake quickly to avoid an accident, and in doing so, I forced the press to tip forward and slide in the U-Haul. It crushed all of the wooden furniture that was in front of it (which, it seems, acted as a buffer and protected the press from hitting the front of the truck cab). Any and all advice on what to try would be greatly appreciated. We live in a small town hours from the nearest repair tech., so we’ll need to try to sort this out ourselves. Looking at the video the table looks a bit too high. The suction cutout needs adjusting, the press should stop when it fails to pick up. As it is card I would try putting on suckers and turning off some of the taps, drop the table a bit and adjust the blow to push the card up. Have you got the valve front left side in the closed position? Do you have an iphone? If not use someone else’s and take a slo-mo video of the gripper right where it misses the sheet. It looks like it’s actually bumping the sheet off the sucker bar. It’s probably just a bent gripper. You can see if both grippers are aligned the same by measuring the clearance to the platen. Mark your grippers A & B to make sure you’re keeping track of the problem one. Good luck. As of now it looks like you have the best press for skip-feeding. Few tips which may be rubbish (apologies if so) but Your Shots 0017 & 0018 look as though they are *bleeding* beyond the stock! is it possible to shift the sucker bar to align the suckers, equidistant from each edge of the stock,? Even in your brief Video, every second - third sheet appears to drop before full grip, and then appears to drop onto the separator fingers, rather than ending up Underneath, can almost be seen bending the Stock with the hard sucker feet, but not the same every time.!!! Possibly a little more Blast separation, with Rubber Suckers on every other Foot, with at least 3 separator fingers, as close as practical to 3 Suckers, far right, far left, and centre?? Maybe also, (with care) Stop the M/c. just after the Sheet/Stock has been picked up, and is just traversing down and across the face of the platen proper.!! To observe (if possible) which sucker loses vacuum first, which may, prove or disprove the the ability of the individual suckers to work efficiently, as a whole and independently. Being alternate sheets the problem is the feed table trying to raise and then stopped by the bar holding down the stock. Adjust the lever towards to thin by one or two clicks. Also try changing the angle of the stock by putting a small roll of paper under the pile so that it is tilting down towards the blowers. Right below the impression knob there is a little badge labeled “Parallel Paper Margin”. The gauge should be dead centered, if it was bumped in your moving accident this could be causing the problem. Youtube videos can be played at .25 speed. Control is in the settings. One gripper is knocking the paper off the suckers. To determine if it’s the gripper, mark them both (a,b), determine which is holding paper and swap them on the carrier. If the problem moves with the gripper, the gripper is at fault. If the problem switched grippers, it is further up the feed chain or gripper timing. OK, it looks like we have figured out what the issue is. One of the gripper arms is slightly bent toward the end (see photos). Because of this, it is looking like it is catching when it passes by the bottom right corner of the platen surface, so it is rubbing against the tympan sheet. This looks like it is causing the gripper arm to not open properly and lay the paper as it should. Any advice on how (or if) to bend the gripper arm? One more photo. All photos show the bent arm in question. This is what I do….Take all your packing off, and measure the good grippers distance from the platen when it is halfway across the platen. That tells you what position the other should be in. Mark the bad gripper with an X just to keep track. With the bent gripper in the vertical position, grab hold and yank (or push) the gripper gently, and check distance to the platen til you reach correct distance. If the gripper itself is bowed, it may need to be replaced. 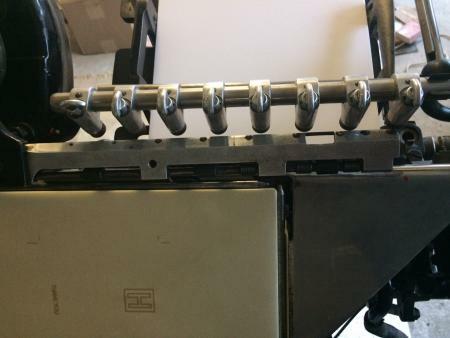 Years ago, I had a Heidelberg mechanic straighten my grippers; he shoved a pipe over the entire gripper, then stood on the press and pulled hard. It worked. I have never tried his method, but my method above has worked several times. I wanted to wait until we had some time to run the machine a bit before posting an update. 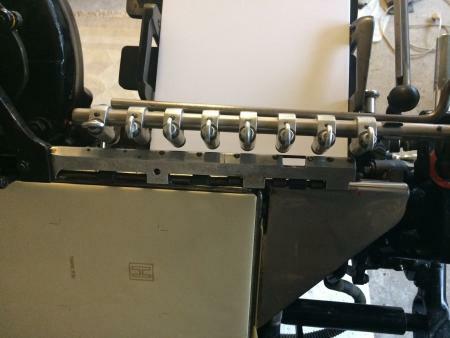 - The problem arm is releasing the paper when it is being pressed and not picking it back up, thus jamming the press and destroying the sheet of paper. This doesn’t happen every time, but far more frequently then it should. - Each impression with the problem arm is leaving this deep impression in the bottom righthand corner of the paper (pictured). It’s almost as if the paper is being grabbed in the wrong spot (too far up? ), and then hitting the spot on the bottom right of the platen (I think it is the lower clamp on the righthand scored edge of the tympan). - There is not longer any back pressure on red ball handle of the central lubrication system. Any ideas for things we should try? Make sure your oil reservoir is topped off, I know it’s obvious, but check anyway.For uneven impression where it’s hitting on the top more than the bottom, add packing, 1 sheet at a time til it’s even. I’d still consider replacing the gripper; check clearance to the platen to make sure it’s even. Recently I’ve been trying to print every other sheet, only throwing the impression on with the good arm. If the impression is thrown off with the problem arm, it does not create the indentation on the bottom righthand corner of the page (as seen in the pictures I sent before). However, the press seems to jamming way more than before, even with the good arm. The good arm will still drop the sheet or pick it up crooked, resulting in a half-printed page, half-printed tympan (see attached). Not sure what is causing this problem. It most frequently happens with the first printed sheet. If the grippers have not been swapped yet, there is still an open question if it is a gripper or the gripper carrier. Stopping the press immediately after feed pickup and slowly advancing it by hand, is a way to carefully look at the point where paper is dropped and when it is grabbed after impression. A helper to slowly roll the flywheel while looking or recording can be very useful. Don’t get caught by moving parts. I think you’re getting caught up in too many issues. Focus on the gripper bar. If it’s bent, you should replace it. Then see what happens once that issue is resolved. Regarding the pressure on the impression lever, are you sure the shearing collar didn’t break? You don’t say how experienced you are with the press, so apologies if this is obvious. Getting an even impression is a mix of packing and impression strength. Too much impression on top means you need more packing or need to back off the impression strength. Too much impression on the bottom means adding impression or removing packing.